Bolton manager Neil Lennon is hopeful of some positive news about the club's future next week. Bolton were unable to pay their players last month as owner Eddie Davies refuses to provide more funds. Their financial adviser, Trevor Birch, said the situation is "perilous". 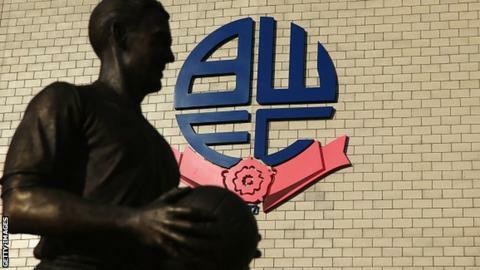 Talks with four parties are continuing, with Bolton trying to avoid administration "at all costs", said one source. "It is looking healthier than it was two or three days ago," said Lennon. Bolton are £172.9m in debt, which Davies has agreed to write off to improve the chances of finding new ownership. Former striker Kevin Davies told BBC Sport that the club, currently bottom of the Championship, could be in administration by the end of the week. Lennon has been assured that is not the case. "Trevor has said that is not going to happen," he said. Going into administration now carries a 12-point penalty in the Football League that would leave take Bolton to zero points, 16 from safety. "The board are pretty confident a deal will get done," said Lennon. "It is a question of who comes up with the money first. It is all to do with people putting money in up front, almost like a deposit."